What are the important Bijapur Attractions for a tourist, check this out. Located at 530 kms north-west of Bangalore and 550 kms from Mumbai, Bijapur City is well known for the great architectures of historical importance. These architectures, Islamic in nature, were built by Adil Shahi Dynasty who ruled Bijapur during the period 1490-1686. The Adil Shahis were great builders and Bijapur became a centre for architetcural activity. The town has about 50 mosques, 20 tombs and numerous palaces. Credit for the main contributor of these world famous architectures goes to Yusuf Adil Shah. Gol Gumbaz This mammoth tomb is a dominant landmark of Bijapur. It is the tomb of Mohammed Adil Shah (ruled 1627-1657), and the seventh ruler of the dynasty. This is the second largest dome in the world. Its main attraction is the central chamber, where every sound is echoed seven times. 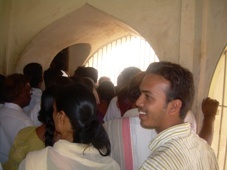 The Whispering Gallery of Gol Gumbaz is also one of the great Bijapur attractions for the tourists. It is thirty metres above ground level. To get there you’ll have to brave the hundred plus steps that slowly spiral through the inside of one of the towers, and it is not very easy.But there are plenty of opportunities to rest. Here, even the minute sounds can be heard clearly 37 metres away. The whole complex of Gol Gumbaz includes a mosque, a Naqqar Khana (a hall for the trumpeters, and now it is used as a Museum maintained by the Archeological Survey of India) and the ruins of guest houses. This magnificent building rises over the Bijapur skyline majestically. It has an immense cube with octagonal towers in each corner, topped by a dome that, at three metres thick and 44 metres in diameter. The interior of the dome is big and white, and the floor is made of rough slabs of stone. This great monument stands unsupported by any pillars. The construction of the Gol Gumbaz was completed in 1659, after 20 years of meticulous craftsmanship. 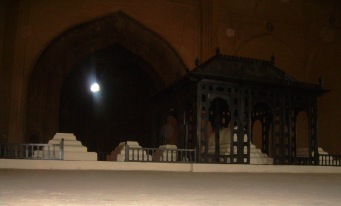 On a raised platform in the centre of the hall are the replica tombsof Muhammed Adil Shah and his family, while the actual tombs lie in a crypt below. One can have a fine view from the gallery around the dome. 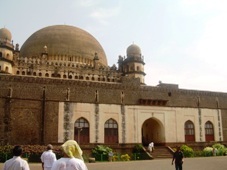 Gol Gumbaz is open from 6 a.m to 6 p.m. The Fort - This huge fort was built by Yusuf Adil Shah I. The main structures in the fort are - the Gagan Mahal which was used as a royal residence as well as Durbar Hall. The Sat Manzil, the seven-storyed palace of Mohammed Adil Shah and the Jala Manzil are noted for its architectural beauty.This cannot ignored while considering Bijapur attractions. Malik-i-Maidan- One of the largest bell metal guns in the world, it measures 4.45 m in length, 1.5 m in diameter and weighs 55 tons. Placed on the walls of the city, a unique feature of this legendary cannon of the Adil Shahis is that it is always cool to touch even under the blazing sun and when tapped gently it tinkles softly like a bell. The muzzle of the gun is shaped like the head of a lion with open jaws & between the carved fangs is depicted an elephant being crushed to death. Jama Masjid- This oldest mosque of Bijapur was built by Adil Shah I, from 1557 to 1686. The mosque is rectangular in shape with graceful minarets and bulbous domes. Ibrahim Rauza- This is the tomb of Ibrahim Adil Shah II, who ruled Bijapur during 1580-1627. He was the fifth king of the dynasty and, like the Mughal emperor Akbar, known for religious tolerance. Built on a single rock bed, it is noted for the symmetry of its features. It is regarded as one of the most beautifully proportioned Islamic structures in the country and is said that it was the inspiration for the creation of the famous Taj Mahal at Agra. Asar Mahal- is located 5 kms away and it was built in 1646 by Muhammad Adil Shah to serve as 'Hall of Justice' and has some holy relics of Prophet Mohammed. Mehtar Mahal - This finely built structure is an excellent example of the Indo-Saracenic style of architecture. It is embellished by a profusion of carvings in the form of brackets supporting the balconies and stone trellis work in Hindu Style. Museum & Art Gallery - There is a museum maintained by the Archaeological Survey of India in front of the Gol Gumbaz. It contains stone sculptures, inscriptions, manuscripts, arms & weapons, chinaware, wood carvings and carpets. In the list of Bijapur attractions, Gol Gumbaz Garden, Jhansi Lakshmi Bai Park, and Netaji Park are included. Bijapur has an Annual Music Festival, organized by the Government of Karnataka. This festival is also a major part of Bijapur attractions to many tourists from all over the world. For shopping, Bijapur is famous for its hand woven Ilkal sarees. Bijapur is also a convenient halt to visit Aihole and Pattadakal. Bijapur is well connected by Bus and Rail. For accommodation, check out Bijapur Hotels with Hotelscombined.